f= ArcTania(x + i y) in the x,y-plane with levels u = ℜ(f) = constant, and v = ℑ(f) = constant. f= Tania(x + i y) in the x,y-plane with levels u = ℜ(f) = constant, and v = ℑ(f) = constant. The complex maps of f = ArcTania(z) and f = Tania(z) are shown in figures at right in the plane x = ℜ(z), y = ℑ(z) with lines u = ℜ(f) = constant, and lines v = ℑ(f) = constant. Symbol ℜ denotes "real part" and symbol ℑ denotes "imaginary part". At least in vicinity of the real axis, the Tania function can be expressed through the Lambert W-function; while the principal branch of the Lambert W-function can be expressed through the Tania function for all complex values of the argument. The Tania function is used in the Laser science for the description of intensity of light in the idealized gain medium. where is distance at which the intensity saturates the gain, id est, . The phenomenology of waves with such a saturated gain has been considered in century 20; some results are published in the Soviet Journal of Quantum Electronics. The function "Tania" is named after the short name of T.I. Kuznetsova. For the applications, the simple and robust implementation of the Tania function is an important tools of the scientific research. For this reason, the description of the Tania function is loaded at TORI (Tools for Outstanding Research and Investigations). Only then the relation with WrightOmega  had been revealed. The WrightOmega function is implemented in many programming languages including Mathematica. 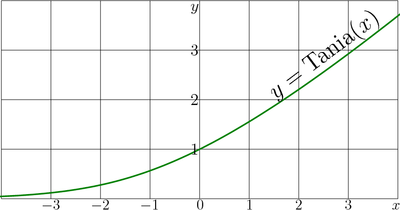 In the left hand side of the figure, between the cut lines lines, the function exponentially approaches zero. In other directions, the modulus of the function is smoothly growing; the growth is similar to that of the linear function. The expansions of Tania in diffrent cases, and, in particular, at the branchpoints is described below. The complex maps of Tania and ArcTania above show that asymptotically each of these functions becomes similar to its argument. 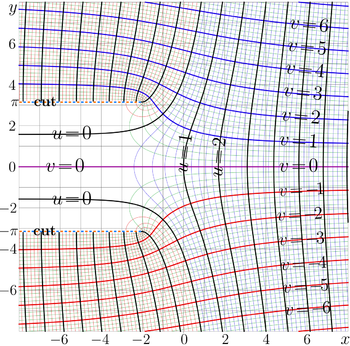 Being far from the branch points (and outside the cut lines), the grid of the lines of constant real and constant imaginary part looks similar to that of the identity function. This indicates that the leading term of the expansion at infinity of should be just . Such an expansion is suggested in this section. The expansions (11) and (12) are not valid between the cut lines. For this range, for large values of the argument, the special expansion is suggested in this section. with the initial approach . Together with the expansion (11), the expansion (13) covers the most of the complex plane, leaving only a finite-size domain that includes the branch points and the origin of the coordinates. The expansion at these points are considered below. has two cut lines at , . The expansions above do not reproduce the behavior of Tania in vicinity of the branch points. In this section, the expansion at these branch points is suggested. The Mathematica Series routine easy calculates some tens of the first coefficients of the expansion. The series seems to converge while ; in vicinity of another branch point, id est, at , such an approximation is not valid. Similar expansion of Tania at point can be obtained by complex conjugation of expressions (9) and (10). 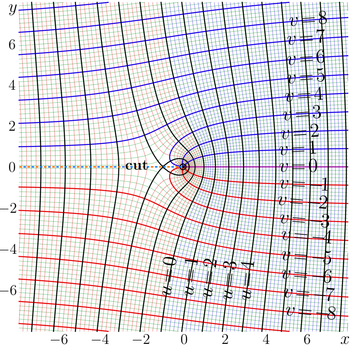 The expansions above, in principle, allow to cover all the complex plane with the approximations of the Tania function. But the expansion at the branch points may be not convenient while dealing with Tania of a real argument. For this case, the Taylor expansions of Tania at the real axis are suggested in this section. However, more terms can be added to the series in (16) and (17). At moderate values of , the exansion (11) can be used for the efficient (quick and precise) evaluation of ; in order to get 14 significant decimal digits, it is sufficient to take 20 terms. The series converges at . The truncated expansions above cover all the complex plane with at least 3–digit approximations. is derivative of the ArcTania function by equation (3). The primary approximations considered in the previous sections allow to get good initial approximation for any point of the complex plane; then the sequence converges to . The Tania function came from the Laser science  describing evolution of the light intensity in the gain medium with simple kinetics. The inverse of Tania function is elementary function. The Tania function can be expressed through the function WrightOmega , but the C++ complex(double) implementation Tania.cin is already prepared; it is used for generators of the figures. The Lambert W function (known also as ProductLog function) can be expressed through the Tania function as well as through the WrightOmega function. ↑ 1.0 1.1 D.Kouznetsov. Superfunctions for amplifiers. Optical Review, July 2013, Volume 20, Issue 4, pp 321-326. ↑ D.Kouznetsov, J.-F.Bisson, K.Takaichi, K.Ueda (2005). "High-power single-mode solid-state laser with a short, wide unstable cavity". J. Opt. Soc. Am. B 22 (8): pp.1605-1619. ↑ Tania function. TORI wiki. The TORI (Tools for Outstanding Research and Investigation) wiki is a specialized website to which D.Kouznetsov is a contributor. This page was last modified 09:47, 11 October 2013.